Bean and pulse seeds like broad beans and peas. 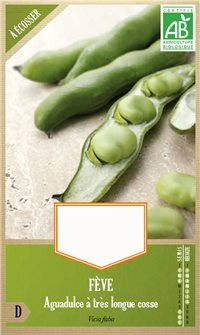 Aquadulce broad beans with a very long pod are a vigorous and productive variety. On average, the plant measures 30 cm and produces 20 cm long pods. 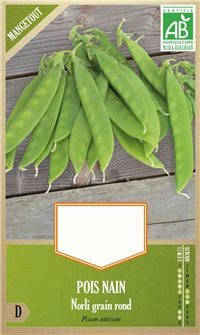 Major French bean seeds, a Mangetout type of variety that is productive, has long thin pods that are golden yellow in colour. Packet weighing 70 grammes. Purple Queen French bean seeds, a Mangetout dwarf variety with long pods that have no strings that is dark purple in colour. The pods turn green when they are cooked. Packet weighing 70 grammes. Norli snow pea seeds, a variety of round pea whose pods can also be eaten young as Mangetout. Packet weighing 70 grammes.